We kick off today's post with long-awaited (and very exciting) royal news. I was scrolling through my Twitter Feed, when I noticed a tweet by the wonderful British Royals account stating details of the Cambridges royal tour to New Zealand and Australia would be revealed on Sunday evening. According to Majesty Magazine "lots of interesting engagements have been planned". I'm very much looking forward to seeing the itinerary which I hope includes a couple of tiara outings, photocalls for Prince George, and of course, events supporting charitable works, perhaps intertwining with the couple's patronages. What are you hoping for? In other news, there have been a couple of stories making the headlines this week, most notably reports William and Kate are allegedly searching for a full-time nanny to take care of Prince George. Since Prince George's birth last July, the couple have been assisted by Prince William's former nanny Jessie Webb on a part-time basis, and Kate's mother Carole Middleton is very regularly spotted at Kensington Palace. However, Miss Webb reportedly came to the end of her contract last month and the Cambridges have turned to nanny agencies seeking long-term help. With a full-time nanny on board, perhaps it signals an increase in royal duties for the royal couple? It's also possible they'll appoint the services of a nanny in order to have someone on hand when needed. William and Kate are very much hands-on parents and I cannot see that changing at all unless there's a drastic change in their royal schedules, which I think rather unlikely. When Kate was catapulted into the public eye, the press not only took an interest in her but her family too, and no one more so than her sister Pippa Middleton. The 30-year-old has received more than her fair share of negative publicity for her writing efforts and flak for "cashing in" on her royal connections. I have to say I've always felt many of the things said and written about her were a tad unfair and imagine the attention she received following the royal wedding must have been challenging to deal with. Earlier this week, Pippa gave her first public speech at a dinner for Women in Advertising and Communications London. Spectators described it as "excellent, entertaining and very open". Pippa spoke about life in the public eye revealing it has its "upsides, downsides and - you may say - its backside." 'She told an audience of 400 at the Savoy Hotel that at the time she was just glad her Alexander McQueen dress fitted before adding "in retrospect it fitted a little too well". Moving on to a look at more style possibilities for the Duchess during the tour, we focus on Her Royal Highness's 'go-to' brands today, beginning with Alexander McQueen. More often than not Kate elects to wear bespoke pieces by Sarah Burton (because... well if you've seen the catwalk collections, the word "wearable" doesn't exactly spring to mind). 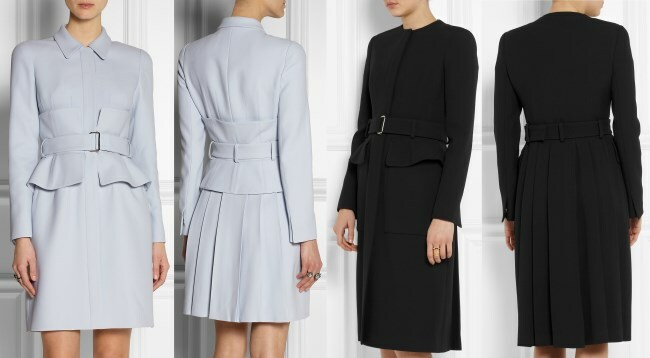 However, I was pleasantly surprised to see several off-the-rack looks which are very Kate, including the Belted Crepe Coat with peplum overlay and the Leaf Belted Crepe Coat. There's a selection of smart day dresses and separates I could see Kate choosing and she's going to need quite a few of those over the duration of the tour. 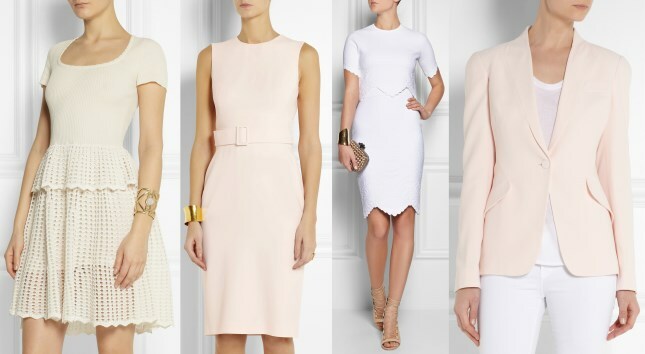 Below we look at the Ribbed and Open-Knit Peplum Dress, the Belted Crepe Pencil Dress, the Jersey Pencil skirt with matching top and the Crepe Blazer. Kate always looks sensational in red, and for that reason this red suit caught my eye. The tailoring and structure is impeccable. The bold red colour is very striking. The red crepe jacket has been crafted in Italy and features lightly padded shoulders and a flared hem. We can expect to see a McQueen gown for at least one of the evening functions. 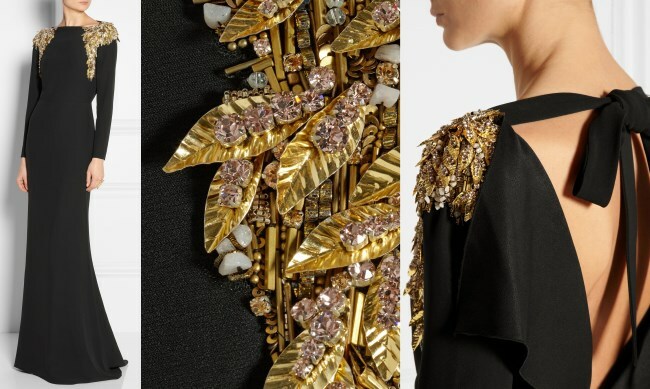 The Embellished Crepe Gown would be a splendid choice for a black-tie affair. The intricate copper and crystal embellishment on the shoulders adds another layer to a classic black dress. Next, a designer we very much expect to see during the first leg of the tour - Emilia Wickstead - not just because of Kate's penchant for her designs but her connection to New Zealand (Ms. Wickstead was born there). 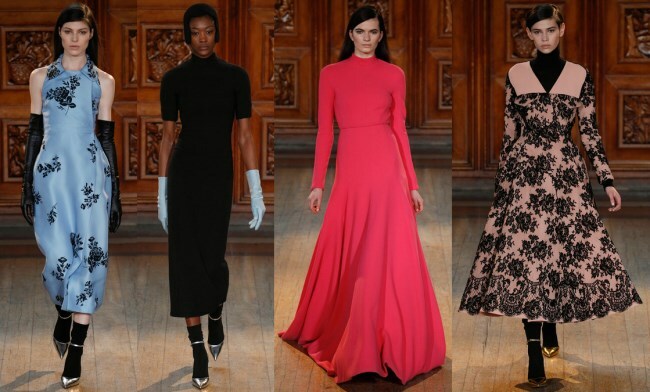 Emilia's designs have been quite hit-and-miss amongst Kate fans, so it will be interesting to gauge your opinions on her Fall 2014 Ready-to-Wear collection. 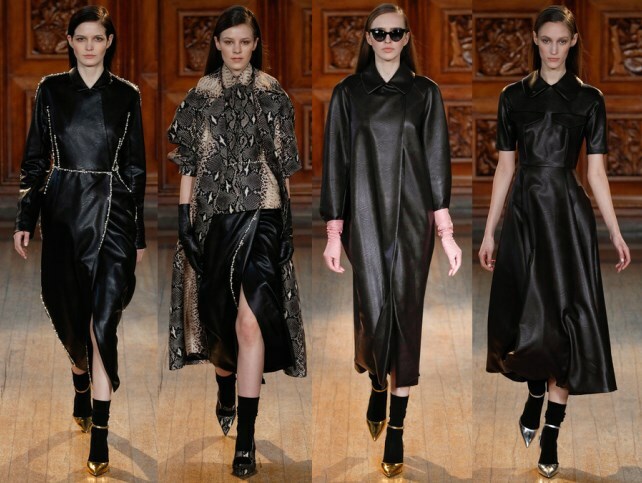 There were comparisons to the wardrobe from The Matrix movies from fashion critics. It has been suggested Ms. Wickstead may have felt she was being pigeonholed and wished to show her versatility in this collection. The designer is still very new to the scene and clearly plans to experiment a little, without straying from design elements her most famous clientèle - including The Duchess of Cambridge - are so fond of. There were familiar looks true to her style too. What do you think? Are you a fan? Thank you, Charlotte. The McQueen embellished gown looks too much like the TV show Dynasty to me, not really a fan and all that clutter on the shoulders makes an up-do a must. Not fond of Emilia's wayward journey into Goth. Are the '90s back? Dear me. Red suit is a smash for Kate. And of course she will need to honor Australian designers, so all that peach and white looks lovely, though maybe not right for a fall tour in Oz. I've always thought the Middleton family has been ill-used for being thought common and social climbers. In the US they'd be celebrated as smart, self-made entrepreneurs. Are they modern day Boleyns? I don't mean that in a bad way. They have given William a much needed sense of happy family life. For that alone, bless them. No surprise they need a full-time nanny. Why shouldn't they? It probably will allow for their children to come along to events where they need minding, and for more joint appearances. They will never give up spending lots of time with their babies, that's not their generation's way. And nannies are the way of their social and economic class. Greybird, Lol. I thought the same thing about the Dynasty gown! And on a more serious note, it's very true that the Middleton's would be admired in the US for making something of themselves....and also for investing in their children's education. I also agree with your comments on the nanny issue. Very logical IMO. In the "Reply as" section, click the down arrow, and highlight "name and url". Type in a name and ignore the url line. Simples. Love the McQueen things, but I doubt we'll see Duchess Kate in snakeskin print! Thanks Charlotte---look forward to Sunday. When we find out just what they are doing it might be easier to guess what her wardrobe will be like. Cannot see her in any of the Emilia Wickstead, but love the black Alexander McQueen---just a thought--it would be great without the metal embellishment, but with one of the super large brooches from the Royal collection or perhaps the Australian opal. Hi Jean, hope you are well. Hi Charlotte and all....great blog as usual. I didn't care for any of the Emilia Wickstead items- maybe it's me but I could not picture HRH in anything that 'dark' however, I loved all of the MCQueen items and could easily see Catherine wearing several pieces. On another topic I have always felt badly for Pippa. From the things I have read about her I don't feel she deserves any of the nasty comments made- they say you can pick your friends but not your family- how it's her fault that her sister will be Queen is beyond comprehension in my book. I like Pippa, I think she is beautiful, classy and intelligent. (Just like her big sis!) I wish her every success. Regarding the search for a f/t nanny... if it means more engagements for W&K then great, but I hesitate to read too much into it since Jessie Webb's age suggested that she would only help out temporarily. In my mind anyway. So Carole having a photo of William -- and only William -- as the wallpaper on her cellphone means nothing? She just loves her daughter's boyfriend so much, she's got him on her phone instead of her husband, children, or pets? I'm sure that even though carol treats William like a son and loves him, she can't deny who he is and that she's proud of him and prolly does brag about him. My cousin is kristen stewart (twilight saga) and even though she's a goof and is treated normally, we don't deny that she's famous and yes some of my teenage cousins have posters of her on their wall. So if the question is if the middletons are enjoying the luxuries of their fame and bragging of their son, the answer is of course. But do they also love him and treat like the goof that we know he is, the answer is also of course. Alexander McQueen's gown is the best !!! I definitely think Kate will wear Emilia Wickstead while she's in New Zealand! When Kate wears anything by Emilia it's front page news in the local gossip magazines, because we take any acknowledgement of nz very very seriously, even if it has almost nothing actually to do with nz. Ugh. Really do not like the Wickstead goth look! Although the black strapless ball gown might be ok. But why did she have all her models in black socks?? Very strange. I think it's often the case that runway looks are adapted for individual users to make them more wearable off the runway, and Kate has done so before with other outfits, so she may not always have to get completely-bespoke outfits from Sarah Burton. Interesting, BTW, that the red jacket (lovely!) was crafted in Italy . . . Thanks so much Charlotte for this wonderful post. I have come to the conclusion that I am not that fond of Emilia Wickstead and I truly hope our Duchess will choose wisely from her creations and its truly slim pickings indeed. I am an Alexander McQueen fan all the way. The red is truly gorgeous. Sunday can't come fast enough for me. Thanks Charlotte. Thanks for the info, Charlotte! Can't wait to see what the tour schedule will look like. Here's hoping that William & Catherine find the perfect nanny, so they have no worries about leaving George whilst they work. I remember (even though my "baby" is 31) the relief of finding a trustworthy babysitter. I can only imagine how hard it must be to find even a part-time nanny. 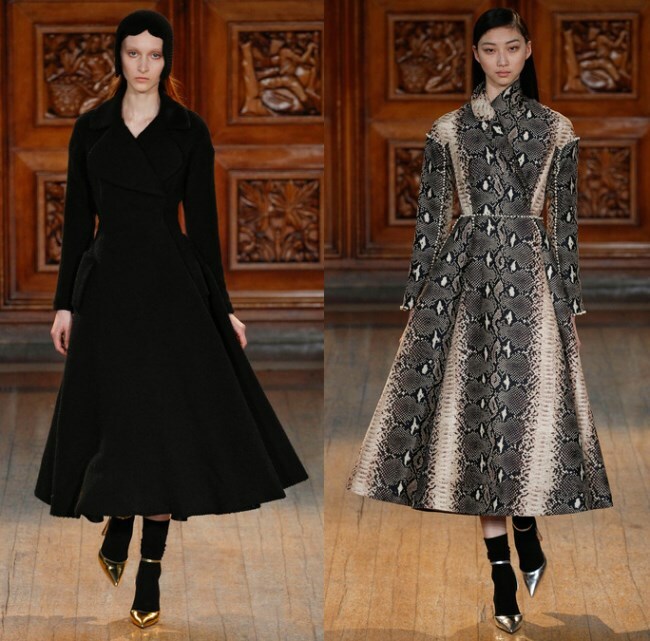 I must say that the Alexander McQueen line is quite Kate-like, but I don't like the latest looks from Emilia Wickstead. The black fabric looks cheap - like pleather! Have a great weekend, everyone! Looking forward to reading your post tomorrow, Charlotte! Pleather...lol. So true! I guess McQueen is the big winner here. Thank you for another great post, Charlotte! Re: nanny search. It had to happen. William and Kate can't keep up this light schedule of duties. I can remember when Diana started and tgd press counted the number of engagements for each royal. They even ranked the royals by those numbers. Pressure to work -- aka have public engagements was very high. These two would have made horrible headlines for their lack of work. Especially Kate. And especially with their two very royal residences. I'm more than a little surprised that the press and public haven't demanded more from these two. Still sympathy for William because of loss of his mother? I hope, in any event, that they pick up the pace. Thank you again, Charlotte. Great. Log! bluhare, I think some of what you define as excuses, is just speculative discussions about some of the "news" that's put out there. But frankly, I wish they didn't share and explain as much as they do because it doesn't do them any favors. William's own words were something to the effect that they would try to keep it simple and do things their way when they can. I thought it expressed both the desire to do things their way, but also a recognition that they will not always be able to do so. Kate had the baby in July and a certain amount of maternity leave would have been understandable even if a statement about it was never issued. During part of this period, William was still working in Anglesey and they transitioned to a life in London. They have done some engagements and the holiday period is known for being quiet on the royal front. And now they have a tour ahead of them which, hopefully, will be the beginning of the next chapter for them. Perhaps this wasn't the best time for William to take a course and be out of sight for most of the time, and perhaps it would have been better if Kate made a few more appearances. Having said that, I think it's unfair and a stretch to condemn William as not wanting a royal life. To be fair, William didn't have the best introduction to public life with the media circus that surrounded his parent's marriage and a person would have to be a blob of playdough not to find his role a bit restrictive to say the least. If someone is prepared to write him off for this, then I wish they would share the same level of outrage towards Charles' desire (no...insistence) on having his cake and eating it too. AND let me throw this out there......have you noticed how much we're seen of C&C lately?.....during this time when people are complaining about W&K being out of sight? Call me skeptical, but let's just do the math. I should probably just quit posting for a while because these two are starting to really annoy me. I'm sick of the excuses, and they are excuses. They're in their early 30's, a bit old for soul searching, especially when it doesn't matter how much soul searching they do; their path is set. They need to just deal with it. The rest of us do. Year long maternity leave is really for mothers who have to work full time in the future, to give them time to care for their babies and find afforable care for them. It really doesn't apply to princesses like Kate and the term shouldn't be used for her. I believe everyone thinks it is good if Kate takes on limited duties in order to have sufficient time with George. But one or two engagements a week is not too much to ask. Bunching a lot of engagements together, makes it seems like you are doing less than spreading them out, even if the amount done is similar. While some work can be done behind scenes, most employers require some visual proof that there employees are working. That's why many of us put on work clothes and set off, even if we could do the work at home. The same applys most strongly to the royal family. Being seen was a vital part of being royal, long before the Internet and press was heard of. Gap years are for coming university students. (And William had one.) No one over twenty-five should use the word "gap" or "transitional" year. It's called unemployment. Continuing education is useful and sometimes necessary but most of William's future subjects have to work while they're doing this. William should too. If Charles (and Camilla) are behind William's and Kate's lack of engagements, they need to rethink fast. They can't save the monarchy on their own. Camilla, particularly, remains hugely unpopular (17% only think she should be queen.) In the present times, change often comes very rapidly without a lot of forethought. Preserving the monarchy is not a given, particularly after the queen is gone. The time to fix things is now. I would never assume the queen has power over her family. Just look at the past. From what I've read, she stays out of things for the most part. So everyone has to do their part. Kate is not a prisoner of anything. She is a well educated, thirty-two year old woman. She is responsible for her own actions or inaction. So are William and Harry. Much was forgiven last year after George was born. But that good will is at danger of being lost. The time for increased involvement is now before bad reputations get cemented. It seems impossible that Britain would toss out the monarchy. But it also seemed impossible until recently that Great Britain might break up. This is a time of change. The monarchy and all members of it should take note. And William should remember his mother's wish for him to be king. I think you make some very good points. I hope you do continue to post if only for the fact you make people think differently. I am sure many of us would miss your viewpoint whether we agree with it or not. Sorry---but I find that quite odd; living in Washington State all you need to do is not read about them. and then you won't get annoyed---simple! I had a feeling people would get upset at kate for not doing enough after PG was born. But then again if she went out too much, people would be upset she's not being a mother to PG. The way I see it, William is transitioning from a soldier to a prince and his training is still in progress. And kate has changed her priorities to include PG at the top, and everything else at the bottom. I can't say I am proud of kate this year since she should be doing more. But I can't be angry at her for choosing her son over appearances. I agree with Bluhare and others it is better if their PR folks say nothing rather than try to make statements to explain. NO one expected her to work 100% after having the baby. But she did more last fall/winter than now. I am now wondering if she is pregnant and they is why they need the nanny and the appearances have slacked off. It would also explain William doing his schooling so he can be around when the baby is born. Odd Charles seems to not want the Yorks to made appearance and now it seems he does not want his sons in the limelight. I guess him and his now wife are what he wants front and center. I think he supports Will and Kate's lack of work efforts as him and his wife look better. I was offering what I think is a reasonable explanation for the past and present, but I do hope this tour is the start of a new chapter for W&K. You don't have to agree with me, but perhaps one or two points I've made may be credible. It seems so odd to me that the entire contingent of senior royals, Charles, Camilla, William, Kate and Harry, seem to be rejecting Queen Elizabeth's availability and accessibility to the public. "I have to seen to be believed," is her famous quote and she's absolutely correct. While the Windsors are multimillionaires in their own right, they reign at the pleasure of the British public by way of an elected House of Commons. The royal family's longstanding assertion and defense of the UK taxpayer footing the bill for their staffs and security and upkeep of the royal residences is that they bring tourism dollars to the UK. That's not going to be a very valid argument much longer if the senior royals continue this sudden and odd reclusiveness and absence from the public eye. Keep in mind that if William TRULY did not want the royal and public life, he could abdicate in favor of his son and/or for himself and George in favor of Harry. In fact, if Charles truly did not want the limelight for himself and his family, the monarchy could be abolished or dissolved and Charles could live the life of a British aristocrat. I think that won't happen because Charles and his family love the trappings of being royalty even if they disdain and dismiss the duties of being royalty. I was a fan of Kate but it seems more and more like the stories of her not being particularly ambitious when it comes to working hold more truth than we wanted to believe. I wanted to think she would prove us all wrong and take on a full schedule of duties with causes that really make a difference in a lot of Britons' lives but that appears not to be the case. No AIDS charities or possibly controversial issues for Kate, but instead charities that, while certainly worthwhile, don't exactly touch the lives of masses of UK residents. And as someone said, what's the deal with William? What new father and husband can just decide to take a year off of work for no apparent reason? The "bespoke agricultural course" at Cambridge is a joke in itself. Millions of working parents work and tend to children and homes AND manage to take college courses too. It's sad that William and Kate are squandering all the good will they built up with their years in Anglesey living "just like you and me" and as "modern royals." They're proving quickly and clearly that they are not at all just like you and me and that they are closer to the closed-off, reclusive, rarely-seen royals of decades gone by than they are to any sort of "modern" and accessible royalty. The Australian tour is becoming less and less interesting as we can expect to see more of the same from the royal couple - then wait as they vanish into their well-guarded, taxpayer-funded compounds for another 6 or 8 or 18 months between engagements. I doubt this will get published due to the strict "Kate positive only!" policy here but here's a last thought anyway - if keeping his family from the public eye to try to INCREASE the public interest in them and their popularity and in Charles as the next monarch is Charles's new PR plan, it's failing badly. Sorry everybody, I'm not threatening to quit at all. It's just that I'm not in a great mood today and when I'm not in a great mood sometimes what I say either doesn't come out properly or I overstate what I think. As this site is a fan site, which I do respect although I recognize some people think I don't, I don't want to appear overly negative. I post here because I like the site and most of the people here. I don't want to negate that just because I'm in a bad mood. So I will respond to everyone later . . . and Jean you're so very right! bluhare - don't go ! If you go I'll have to follow :) I greatly enjoy our conversations - it's so much fun. Jean from Lancs, I am sure that bluhare is aware of her options. It makes for an interesting time when you have all sorts around us - don't you agree ? If everyone always agreed with everyone else this page would be quite boring - no ? Bluhare if you don't want to Comment anymore then don't no one is forcing you to or forcing any of us to follow this wonderful blog. We may not agree with everything Catherine does but if we all have differing ideas of whether what she is doing is correct or not imagine how she feels knowing how many differing opinions there are in the wider community! Seems she is dammed if she does and dammed if she doesn't. Love the Alexander McQueen by the way! Portia, don't worry . . . I'm not going anywhere. And BRING IT!!! The best wishes for all of prettiest women. 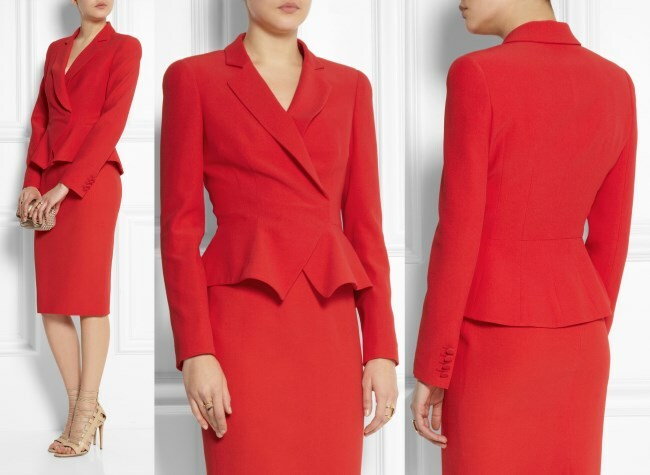 The red Alexander McQueen suit is lovely, though Kate already has two bright red outfits. I rather like the lacy blue two piece Wickstead dress, the length of which Kate probably would change. The Wickstead black day dresses, in other colors, could be nice, and also the floor length red dress. Those pieces could lend themselves to major jewelry. 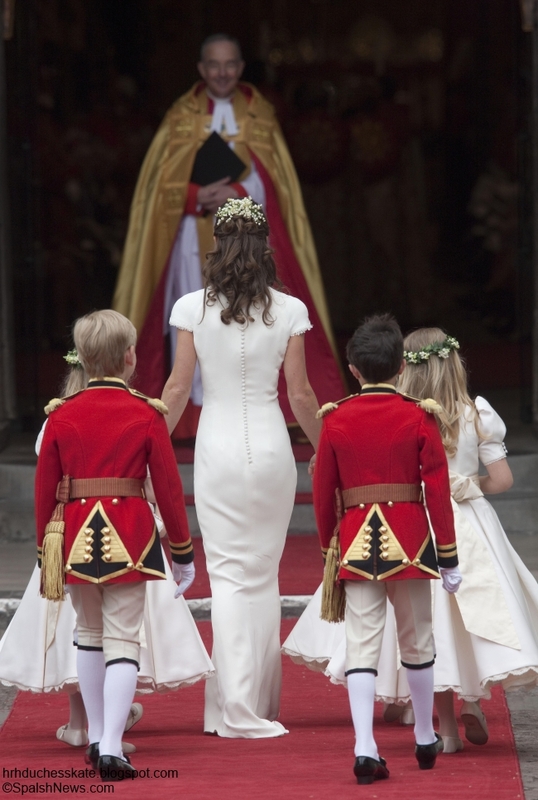 I wonder whether Kate would wear the white Alexander McQueen with the zigzag hem and bodice, maybe in a color, and he has some plainer day dresses that she could dress up with accessories. Kate puts her own stamp on the outfits she wears, and usually looks better in them than the models look. i am a McQueen die hard. have a piece from as many collections as i can save up for. He is definitely rolling in his grave.Acquitaine. Acquitaine, if you tell me you've got a piece from his Highland collection, I will hate you forever. I am SO looking forward to seeing what the itinerary holds for the Australia/New Zealand tour! I know it will be a wonderful time for the Cambridge family and representing the Queen. 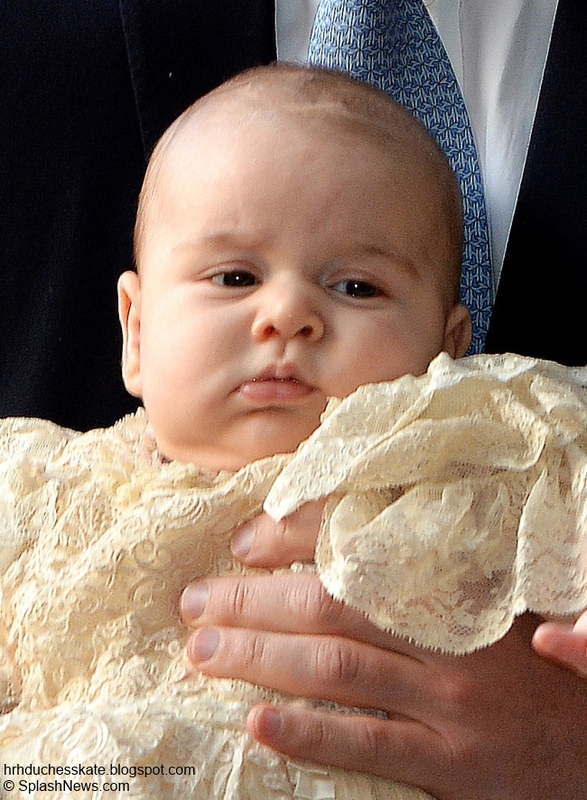 Definitely hoping for a tiara event and a photo op with Prince George! I do feel bad for Pippa and the Middleton family. I think they get bad publicity and the 'ol "cashing in on their royal connections" WAY too much. They are bright, successful individuals whose daughter/sister happen to fall in love with the future king. They were successful and doing just fine before Prince William came on the scene. I feel we should respect them for the people they are and success they have earned. We all know how William feels towards them, and the Queen for that matter. I wish there was more positive press every once in a while. I am SO looking forward to seeing what Kate will be wearing, especially the jewelry for the tour. So much to look forward too! Hope you all are having a wonderful weekend! I think Pippa was lumped in with her mother, who has been portrayed as greedy, grasping and intent on having one of her daughters marry Prince William. I can't imagine being in the situation that Pippa has been put in - with few of the perks yet all of the headaches of being related to a member of the royal family. I imagine it's been especially hard for her, since she was very social before her sister was part of the royal family. She seems to be a very outgoing and genuinely nice person. The irony is that Pippa really hasn't done anything that William's cousins, namely Peter and Zara Phillips, didn't do before this. But they're royal so it's seen as okay while Pippa doing sort of the same thing is seen as crass and greedy and middle-class. I sooo agree with you Kate. I completely agree with you Kate! I'm a longtime follower of this blog and have regretfully decided to stop reading and posting. I'm so disillusioned with William and Catherine. Their lack of work and interest in charitable endeavours is scandalous. I'm further disillusioned with the press writing articles about the pair of them looking for a nanny because the royal workload is exhausting. They have a power to make a difference and chose to act like privileged teenagers. I'm a mother of three, with a full-time job, I volunteer at a local hospital every Saturday and as a British taxpayer it is WRONG. WRONG. WRONG. Charities are struggling and need support. I'm stepping away now. Thank you Charlotte for all your hard work. Thank you for following and commenting, it is greatly appreciated. Well done on your charitable work, I volunteer myself and it is so worthwhile to give back when possible. I've lost a few long term readers for this reason over the last couple of years, I'm always sorry to see a reader go but very thankful for your support. Anonymous, while I like to check back to see what's going on - if anything - I do have to agree with you. I am deeply disillusioned by what William and Kate have become. I think they held such promise before their engagement and now it's all gone flat. They had the power to maintain that momentum but it seems now like they don't even care. That's too bad because with their age and their ability (back then!) to relate to the public, they could have made a real difference in so many areas that matter to everyday Britons. But Charlotte does a great job, in spite of a drought of appearances by William and Kate, with the blog. They and their PR staffs need to take some lessons from this very well-kept, current and well done blog!! Hi Charlotte, hope you are having a lovely week end. Loved the dresses. I'm here and will continue to be a William and Kate fan. thank you for all your hard work bringing us this lovely blog. Still think I should be George's Nanny!!!!! I think they are employing a full time nanny so that they CAN do more charity work. They had a baby less than 12 months ago, I think Kate has done more than her fair share of work. She always looks engaged and happy. They have renovated 2 homes, I could not imagine the time and effort put into that. I truly believe Kate and William are a long term plan as far as their royal duties go. I also think they should have taken a skiing vacation, they have not had much time together. Florence, u make some great points and I value your opinion. I'm sure she does a lot of behind the scene work for her charities during PGs naps. But if u look at it from a "maternity leave" point of view, she's over her timeframe. Other moms remodel, take care of their newborn, and still go to work when their leave is over. I know its hard comparing kate to normal mothers, but her leave was over and she was expected to do more. I think that's the main issue with what people are mad at. I'm not mad at kate personally since I think she did great work while she was pregnant and while in Anglesey. But I don't find it valid for her to take a longer leave just to vacation and remodel a house when we all do that every day. Charlotte: Who (or what committee/group of persons) outlines the official expectations re: job duties for William and Kate? Everyone has their own idea about what they "should" be doing, but is there any official source of guidance? "You cannot teach a man anything; you can only help him find it within himself. "~ Galileo Galilei. Is all of this feast/famine, back to school, extended leave behavior just the result of a simple lack of guidance for their official roles? I'm not Charlotte, but I don't think there's a job description per se. I post at another board and there's a poster there who always says that Charles had no job description when he became Prince of Wales and because he's been POW for so long, he's had to invent one, and I think he's doing a pretty good job. I would assume it's the same for William. And I'm going to point my finger at William as I think Kate just goes along with what he wants. William doesn't want the job. It's as obvious as the nose on my face (trust; it's obvious!!). If he wanted to do it, he would be. Instead we've got Year What of his gap year? It's getting ridiculous. I think someone yesterday or the day before said that his sour face on the jubilee boat ride was because he's been told it's time to step up and he doesn't like it. If Kate really does want to work and William's holding her back, I feel for her. However, from what we've seen, I am not sure that's true. This man is going to be King as will his son, and what a great example he's setting. Not. I agree the gap year wasn't the best move. I'm told it will be years before there's a transition to full-time duties. Seriously, Charlotte? William is seriously tone deaf and either has terrible advisors or doesn't listen to them. PS And if that's true, why do they now need a full time nanny? Seeing as they're so hands on and everything. I've heard William is considering a "public service role" and will spend up to 3 years in this role meaning full-time duties are a long way off. THIS is why i have a problem with William. And you know what? People will continue to give him a pass despite the fact that he has managed to extend his 'royal duties' deadline for 10yrs since he graduated!!!! and no, military service isn't required. Britain doesn't train heirs in the old fashioned 'leading an army from the front' sense since the 18th century. Philip is a military man and rules the family according to his personal wishes. In that sense, that's why they have all ended up doing the military thing. it's not a requirement, and HM herself nor her father needed to be in the military. Advice to Emilia Wickstead - don't worry about being pigeonholed. Your clothes are timeless, lovely, classic and elegant, four qualities that fashion and style today are badly lacking. I love the classic Wickstead and classic Burton/McQueen designs. I don't think we'll see Kate in ankle-skimming skirts, which always look, to me at least, like they're badly tailored. And I certainly don't expect to see her - or any other woman of classic style - in a Goth gown anytime soon - or ever, hopefully!! I would expect to see some repeats as well as some elegant casual clothes. Keep in mind that the Aussies aren't as hung up on protocol and rules and ceremony as was the case with the Southeast Asian trip. So I think we might see fashion more akin to the US/Canada trip, appropriate but not overly fancy or fussy. I would expect to see more suits, the knee-length skirts, more tailored dresses and more statement jewelry. Hopefully, by the time she lands in Sydney, Kate will have been convinced to update her hairstyle a little or to try some new ways of styling with her current hair. Think of Princess Diana during her 1996 tour of Sydney, that kind of polish and professional wardrobe but brought into 2014!! Latest rumour/gossip is that Kate and William have hired a young foreign nanny. Hope this isn't so. While there is all this talk of United States of Europe, I don't think that sits too well with traditional monarchists. And unemployment is such an issue in England, that employing a British nanny would certainly be a wise and tactful choice. There has to be ample qualified domestic nannies available. As for the Middletons, it has long been said that the best thing for family and friends of those who marry into the royal family is to stay out of sight as much as possible. Think Sophie's family, said to be very close to her but invisible to us. Prrincess Anne's former husband Mark Phillips's family were said to be good friends with the queen but stayed out of sight. This is nothing new - it was true when there were marriages into other foreign royal dynasties or poweful British noble familes. Too much influence has always been a worry. It is especially true for heirs such as William. One day, he will have the ear of the govenrment at least to some extent. No one wants to think his opinions are guided by the Middletons. I think there has also been discomfort because of odd coincidences in Kate and William's past. There has always been an unpleasant hint Kate was encouraged or assissted by her family to target William. (Not just the same university but the same gap year project, even though they didn't connect at the same time.) Whether this is true or not, it made the Middletons look pushy. The fact Kate worked for her family didn't help. (Or help her work ethic. No matter how hard Kate worked, there is nothing like a demanding boss and co-workers from hell to teach you about how most people have to live. Working for your family is not the same.) It was said Kate couldn't easily find employment because of the press attention but Chelsy's ease in finding a post at the same time put paid to that idea. Even at the time of the engagement, this was an issue and Kate assured us she was a hard worker in her first interview. While generally the Middletons have behaved admirably, there have been blips. Pippa's book was top of the list - not a bad book but too much too soon when she was too young and inexperienced. (A similar argument could be made about Tom Parker-Bowles, but I reluctantly admit, his writing is provocative and interesting.) Pippa has always acted a little too much like she was trying to catch a titled husband too. I think when she marries, attention to her will settle down. As for James, every family has their wild man but I don't know that his romance with Donna Air is going to do much for the Middletons' reputation. It is a very delicate balance. Most people thought it was fine for Kate to go home after George was born but maybe Michael Middleton shouldn't have taken and copyrighted the only photos of the baby. The queen has been very gracious about the Middleton and that is something to be taken gratefully but also guardedly. I think most people are glad Kate and William have a close and happy relationship with her family, wish the Middletons would impart some of their work ethic, but don't want to see too much of them. Hmmmm I still think I would be the Best Nanny for George! Not fair. Charlotte the dresses are beautiful! Charlotte, I love your blog and enjoy reading it. I check every day for new updates! Love the red suit, really don't like the Gothic dresses for Kate. I've wondered, does she really buy all of these expensive clothes, or does she "borrow" some of them from the designers? I would love to see her closet! So many articles have criticized William for taking the courses at Cambridge. I do not see how this is hurting anything or anyone. Would they rather William take over the duchy with less knowledge about how to manage it? Was Charles criticized when he took a similar course 40 years ago? There has been much discussion recently about W&K's workload. While I agree they have not appeared in public very often recently, we do not know what they are doing out of the public eye. I am the same age as W&K, and my grandfather is the same age as the Queen. I can't imagine how William feels, looking at his grandmother knowing she has been doing the same ceremonies for 70 years (62 years as Queen and almost 8 years as a grown Princess), and that he will be doing the same things for the rest of his life too. Yes, he has plenty of money, lives in a palace, etc. but this life was chosen for him and (for the most part) his future is out of his control (unlike Kate, who chose the life after many years of patient waiting - she could have turned away). My grandfather retired when he was 60, unlike the Queen who has continued to work tirelessly through her 9th decade of life and will (God willing) continue to work through her 10th and possibly into her 11th decade of life like her mother did. My point is, even though their workload may seem light now, they both have many years of charities, ceremonies, state dinners, foreign tours, etc. ahead of them. There will be no retirement for them, their duties will continue to increase with time. Long live both the Queen and Prince Charles, however it must always be at the back of William's mind that his life will drastically change with the death of either the Queen or Prince Charles (and that this could come at any time). I fully expect that when either the Queen or Prince Charles dies, W&K will be in the spotlight and working full time for the rest of their hopefully long and fruitful lives. Another point I'd like to make - the Queen has a rocky relationship with Prince Charles partially (or fully) because she did not spent much time with him as a child. I think it's wonderful W&K are spending as much time as possible with George now, while they can. They are building strong family ties which will help them get through the inevitable stressful and busy times which lay ahead as Prince and Princess of Wales and King and Queen of England. This type of bonding is important for every young family, regardless of social status or occupation. We all have stresses and battles to fight. If you look at the early years of the Queen and Prince Phillip's marriage, they were not in the spotlight often either - yet their workload and royal duties have been near flawless and unrelenting since the Queen ascended the throne 62 years ago. They left their children with nannies at the Palace a considerable amount of time so they could enjoy time together and Phillip could pursue his career. And this was while the Queen was first in line to the throne........William is second in line right now. I cannot imagine what it is like to live your entire life under a microscope of the world. Every step you take, every word you say, every outfit and hairstyle, practically every decision you make being watched and criticized by people all over the world (including me!). And thanks to the Internet, we will always be able to look back at the bad moments. I keep seeing the pictures of Kate's yellow dress blowing up in the wind - I encourage the press to stop posting those and give her a break. We've all had a similar fashion mistake but 99.99% of us did not have it posted for the entire world to see for eternity. Spot on with your post. William and Kate have the rest of their lives for royal duties. George will be a baby once. In a couple years, he will be off to school. They need to bond as a family before William becomes heir apparent and is locked into a life of royal engagements until he dies. The term "working royal" is an oxymoron. Basically what the royal family does is show up places where OTHERS are working and give a couple of "well dones"! "Yay You!" for doing actual work! They'll be doing this next month in Australia and New Zealand and go to lots of parties and be entertained for free. Now the moment we all think rich people taking a free vacation to tour two foreign countries is "work"... It really is insulting to the working class. Now, having said that, I can't wait to see what the rich people wear when they go to Australia and New Zealand! And I hope we get to see the baby! I hope to see Kate in McQueen. 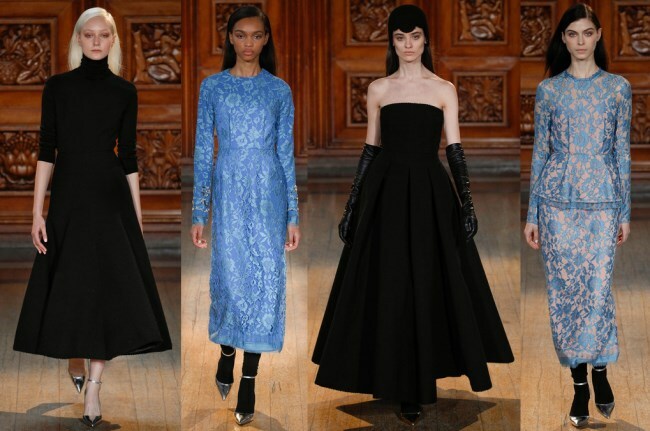 Not a big fan of the gothic look of the newest collection by Emilia Wickstead but the McQueen pieces do look lovely. I can't wait for them to start the tour and of course see baby George. He is a real cutie. And the by the way, I personally like the charities that Kate supports especially EACH. My parents are doctors and I see so many of their patients who are terminally ill and live in hospices go to their clinics for check-ups. It's really heartbreaking and it makes me smile to see that she brings a ray of light to these kids whenever she visits. I don't believe there are exact expectations in terms of the number of engagements which are to be carried out. The Queen, Prince Philip, Prince Charles, Camilla, Anne carry out a very a very full diary of engagements. I guess it's more to do with public perception and media coverage. People expect to see the Royal Family out and about supporting charities. Hello I am a long time follower as you know I don't comment as much now mostly due to time and where I'm reading the blog. But I still love it William and Kate I think are being groomed to take on a huge amount very soon. William I think is about to take on the running of the Sandringham, Balmoral and probably Windor estates from his Grandfather hence the specialist course at Cambridge. I think the Queen sees Catherine as stepping into the "consort" role in a way that Camilla can't and/or doesn't seem to want to. You watch the Queen and Catherine together for instance at Buckingham Palace and it seems a natural progression. I shall probably be shot down in flames for this. I love the fashion updates you give us I would not be able to do this on my own wouldn't know where to look. And as for Sarah for California I'm sorry they didn't choose you. You would have been a brilliant nanny for George. The Queen ( I respect her sooo much) has learned hard life lessons like many of us(and we not in front of millions of eyes) that said I believe she is thrilled to let William, Kate and George enjoy enjoy their little family before the weight of the world falls on them. We can only speculate about the reason(s) behind what is happening (or not), but there *are* reasons for it. And I do not believe it's a case of William or Kate not wanting to accept their roles. I know I keep saying this, but I strongly believe that the royals don't want a repeat of history. William doesn't want to see Kate in the position that Diana found herself in and Charles doesn't want another Diana in his life. He prefers it when W&K are out of the spotlight because this allows him to focus on his own goals (not a new concept really). But going forward, I do hope we will see more of W&K or their reputations could suffer in the long run. I am happy to see some very positive comments here today! I like the McQueen offerings especially the red suit. Sara Burton always has the clothing nicely tailored for Kate and the length of the skirts up to this point have been professional. Emilia Wickstead - I just don't like the clothing. The things she has made for Kate just don't seem well made and the fabric is either heavy looking or wrinkly. I would like to see Kate try Victoria Beckham sometime. Victoria has some nice dresses - too expensive for my pocket book - but some nice dresses. Anyway, as another poster mentioned, here in the USA, we tend to see their success in a more positive light. Theirs is the "American dream". I do think that the Pipster needs to find a real job. She seems to be in the "socialite" category. Hiring a PR company indicates to me that she intends on being in the spotlight. If so, then I would do something more substantial than write a weekly Waitrose article... To be honest, I would have rather heard Carole speak of how she became so successful than Pippa speak about her fame since the wedding. I do think that Pippa could give Kate some pointers on public speaking. I am not sure why Kate could memorize her lines in a school play and yet not be able to deliver a very short speech without notes. William and Kate really should think about putting some of themselves in their public addresses instead of using phrases that are generic and hollow. The words "amazing", "brilliant", "awesome" are used way too much. How much more insightful would it have been if Kate told the audience at the museum what the museum means to her and what her favorite pieces/exhibits are. She seems extremely nervous to reveal herself to the public so she stays very generic. I think that William has a lot to do with the number of engagements. I think that he is the one controlling the public appearances and calling the shots for his immediate family. The palace is just going along with it. I can't wait to find out if there will be any tiara-worthy events on this tour, I certainly hope so! I would love to see Kate wear the Halo tiara again, without the veil we could get a really good look at it. However, the Lotus tiara is stunning and the little teaser photo of Kate wearing it to the Diplomat's reception just wasn't enough for me. I really like the McQueen dress and can easily picture Kate in any of them. The Emily Wickstead, not so much. Just to weigh in a bit on the whole "do they work enough" debate. I really don't think that we will see a big increase in the amount of engagements Kate attends for many years to come. I think, now that George is getting older they will start wanting to expand their family. Both Kate and William have siblings that are close in age to them and they might want that for their children. Having said that, I feel that if she were to undertake, say 1 engagement a week, instead of 2-3 in a week then nothing for the rest of the month, the perception of her could change. Also, I would love to see more substance from her. The fashion is all well and good, but adding a little substance would just be the icing on the cake. I frequently see photos of Kate out shopping and have read that even her admirers are referring to her as the Patron of Peter Jones. We need to remember that even when Kate and William were dating, she wasn't ambitious regarding her own career as William was with his. Kate has built her life to revolve around William and his wants and needs. The only time she struck out on her own was during their breakup, when she joined the rowing team, but as soon as they got back to together she dropped it like a hot rock. I am being to feel that Kate will never be the Princess we all hoped she would be. She will wear lovely clothes, give birth to adorable children, dote on her husband and I think that's about it. For all of you people here who are knocking William and Catherine for what they do for the royal family as far as working, should walk a day in their shoes before you open your mouths. You all have no idea what goes on and who tells them what to do and where to go. Until you can say that you know for sure that then I would not get so upset and tell Charlotte that you are going to stop reading the blog because they are not working hard enough. That is a little childess. CHristina, I would LOVE to walk a day in their shoes. And telling Charlotte reasons for no longer visiting is not childish. Complaining about it might be, though. Star magazine continues to "report" that the duchess is pregnant; last week, they said it's a girl, this week, twins! They have been insisting on this since Chistmas. Could explain fewer engagements and the vacation. Grocery store tabloid headlines are never true. They're just there to make us groan while we wait to pay for our food.